From first sight to final inspection, utility pole inspections are a vital part of successful field asset verification. So what really happens out there during assessment of equipment? Today, we step back and consider a higher-level concern for anyone who owns utility poles and deals with day to day maintenance, repair and replacement: E for Equipment Management. Every element of field equipment, from the wood that makes up the pole to the wire that keeps it safely grounded, plays a vital part in ensuring the safe, reliable and consistent delivery of your service to your customers. Assets must be maintained, preventing them from becoming liabilities if they fall into disrepair, and consume significant time and organizational resources each time you have to roll a truck to address and correct an issue. Knowledge in the form of complete and accurate field asset data can affect both organizational effectiveness and the bottom line if the data is used to drive an efficient asset maintenance program. In conducting over 4 million pole audits, Alden’s technicians have seen it all - wild animals, dogs, insects, invading brush, inclement weather and constricted work spaces. With respect to equipment management, there are two main problems that represent the majority of reported maintenance issues. We’ve sounded the alarm on the issue of double wood due to backlogged pole transfers and idle poles before, but our technicians warn double wood continues to be a significant issue, therefore it warrants a mention here. The reality is, if remedying double wood is delayed, the number of duplicate poles will grow—making it more difficult and certainly more costly for the joint use organizations to address the old pole removal. Given the growing backlogs of double wood in the field, most utility providers will need an inventory or asset verification completed to verify the extent of the problem and initiate remediation activity. Also, a review of current joint use business contracts and permits dating back a number of years with regard to the double wood poles is needed to get the job done in determining existing ownership of duplicate poles. Following this determination, a managed field audit can also help identify completed transfers (to be removed from the maintenance schedule) and those that still need work. On those not yet completed, the field technician can also determine the resources required for the needed transfer and removal to allow the utility to more effectively schedule or contract the required work to be done. A second equipment situation that has become a real issue during NESC-specific inspections is a damaged or missing ground wire. Ground wires provide an outlet to ground from the pole in cases of lightning strikes or power surges protecting high-tension wires—and humans—from harm or damage. If a ground wire is missing or damaged and a power surge occurs, the electrical surge can backtrack through the lines and find its way into the nearest residence or business, causing electrical damage and, in some cases, fire. Damaged and missing ground wires obviously then can be a real liability. How then do they become damaged or even nonexistent? 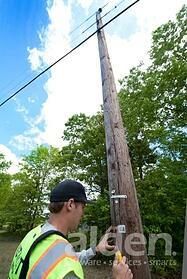 In some areas, thieves pillage poles regularly, removing two-to-three-foot sections of valuable copper wire. Utility providers in some areas have call centers where residents self-report problems in the field, such as missing ground wires, but best practices dictate the only way to really know the true condition of your plant is to send someone to take a look. What’s next on our list? F is for Forty Inches. After the standard inventory is finished, if this wasn't completed via a single-pole visit, technicians will often perform a secondary GEO95 or NESC-specific inspection looking for potential violations. NESC will include line inspections, measuring the distance between the lowest communication line and the power neutral or highest power line. The mandate: the distance between the two lines must be more than forty inches. Be sure to see our installment for this next letter in the NESC inspection alphabet.